Are you looking for a sweet resource that pulls together a vast array of relevant physician contacts into one database that can be easily integrated into your CRM? Bookyourdata.com’s directory of diabetes specialists is ready for you to download now. Millions suffer from Type 1 and Type 2 diabetes, needing frequent insulin shots and blood monitoring to get a grip on the disease. While being common, diabetes can also be complicated (and fatal if undiagnosed). Specialists need to educate diabetics about this common and commonly misunderstood disease while recommending diet, exercise, and medicinal changes. They talk often to older adults who may also be managing other health issues, and they need to help monitor and manage the drug and insulin usage of their patients. If you have a product that can help diabetes specialists and their patients, let them know using this consolidated and accurate lead list from Bookyourdata.com. Get in touch with them today and you'll be able to market your unique insulin product, blood monitoring device, pharmaceuticals, diet program or booklet, diabetes education tools, or other relevant products and services for this unique niche. Diabetics need a variety of help, drugs, and guidelines for leading a healthier lifestyle. Connect with their doctors today. 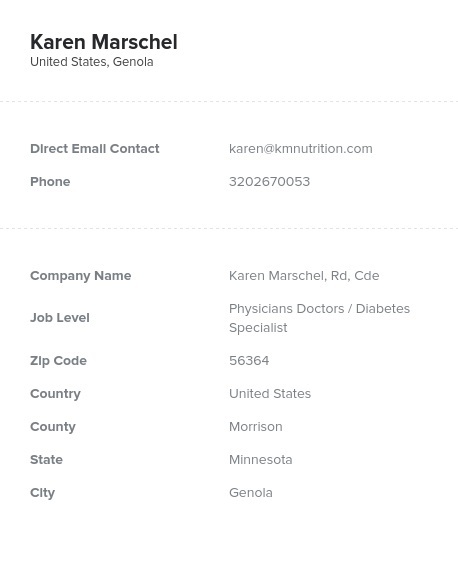 This premium contact directory is full of great nutritionist contacts, including vital information like emails, phone numbers, names, company information, and more. It's a pre-built, ready-to-download data product that can help you start marketing within minutes. Download it today!